Forecast: High Anxiety, Increasing Laughter With a bride on her wedding day and an ex-boyfriend lurking among a houseful of eccentric guests, Cheerful Weather for the Wedding seems set on a predictable track. 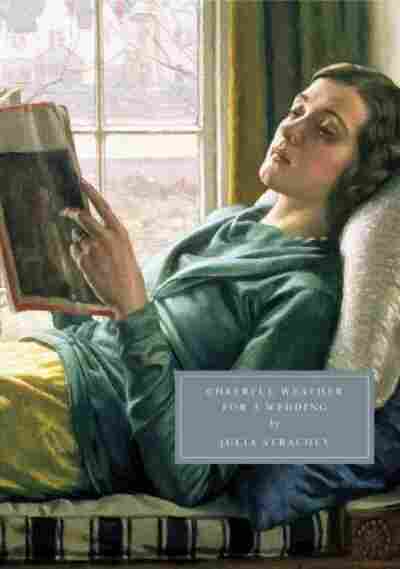 But Julia Strachey's frenetic, screwball novel has some twists in store. The framework of the romantic comedy is now so ingrained in our collective unconscious that given some basic plot points — a bride on her wedding day, an ex-boyfriend lurking about and a houseful of eccentric guests — an 8-year-old could tell you the story will end with the bride in the arms of her ex and the groom in the arms of a consoling cousin. Right? Not with Julia Strachey's Cheerful Weather for the Wedding. It falls into the screwball comedy genre, but none of the players behave as you might anticipate. That bride, Dolly, has been drinking rum straight from the bottle all day and, to get her through the ceremony, is now trying to hide the half-consumed fifth in the folds of her gown. The ex has something to declare, but it's not what you think. And we barely see the groom at all. Even the weather is in a turbulent state, banging open windows and tormenting the befuddled guests. With her knack for the unpredictable and the frenetic pacing of a Howard Hawkes film, Strachey creates an environment of comic high anxiety and unexpected imagery. The ferns in the sitting room, she writes, "arched their jagged and serrated bodies menacingly." Metaphors that at first appear whimsical are quickly revealed to be perfectly apt, as when Strachey describes the bride's forgetful mother, who has just assigned half of the overnight guests to the same bedroom, as having the worried facial expression of someone who'd "swallowed a packet of live bumblebees." 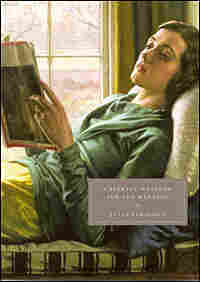 Strachey, a Brit whose upper-middle-class life was as careening and crowded with high hopes and dashed dreams as this book's loopy storyline, wrote only two novels in her lifetime: Cheerful Wedding, originally published in 1932 and out of print for decades, and 1951's The Man on the Pier. It's a shame. Her sharp eye, playful language and perfect comic timing will not only have you laughing, it'll leave you wondering why the rom-com formula isn't imaginatively tweaked more often. Thrown out full length on the sofa lay a schoolboy cousin of the bride's, aged thirteen — the black-haired Robert — reading The Captain magazines. Robert had eyes that were lustrous as two oily-black stewed prunes, or blackest treacle, and the complexion of a dark-red patch. Padding up and down in front of the staircase, with something pompous and uncanny about his tread somehow, was Tom, his elder brother. Tom was fair and pleasant to look at, but at present his blue-china eyes were bulging out his head like a bull-frog's. Both boys had just had their hairs brushed neat as satin, and both had changed into black spotless coats for the wedding. It was as if a big bubble had suddenly risen from the bottom of a dark water-tank and burst, low and hollow, upon the surface,-there was nothing about the slow padding figure of Tom to indicate that it was he who had spoken. "Robert. Robert." All the while Tom kept up his padding backwards and forwards. "Robert." Now the word came softly from behind the sofa-head, Tom having padded round there unnoticed by his younger brother. "Robert," repeated Tom softly . "Robert. I say, Robert. Robert. Robert." "YOUR MOTHER WOULD UNDOUBTEDLY DESIRE THAT YOU SHOULD RETIRE UPSTAIRS TO YOUR BEDROOM, ROBERT, IN ORDER THAT YOU MAY CHANGE THOSE IMPOSSIBLE SOCKS." There was no sign of life from the patient. "CHANGE YOUR SOCKS, ROBERT. DO NOT TAKE ADVANTAGE OF YOUR MOTHER'S ABSENCE TO PLAY THE CAD, ROBERT." Robert's black shoes sticking up on the arm of the sofa were crossed one over the other, and revealed a gleam of emerald between the shoes and the trousers. Robert dashed The Captain to the ground and said, jerking his head up towards Tom, shouted, "Shut up, you bally idiot, Tom, will you? " There were tears in his voice. "What right have you to keep on bullying? You're an infernal blithering bully!..." And snatching up his magazine he started reading it again. "Robert, your mother would desire you to go upstairs instantly to take off those bounder's socks, Robert, and to change into a respectable pair. Will you go, Robert? "What the blazes do you mean? I have just changed into a respectable pair of socks, I tell you!" cried Robert, jerking his magazine away in front of his face, and added, "Go and put your head in a bag." He gave a gulp and went on reading. "THESE ARE NOT PROPER SOCKS FOR A GENTLEMAN TO WEAR AT A WEDDING," said Tom, bending over the sofa. "Go and put your head in a bag," murmured Robert. Tom aced slowly away across the springy carpet. "Would you keep your mother waiting--"
"Oh, go and put your head inside a bag!" said Robert. There came a piercing shriek from a female voice half-way up the staircase. "Lily! Go instantly, Lily, I tell you! Go along! Go now! Go!" Someone came clattering down the stairway. "Go to the sewing-room immediately and tell Rose she is to find that brooch for me within five minutes!" and Kitty, Dolly's younger sister, bounded down into the hall. She was a big, bold-looking girl of seventeen; her hands, red and much swollen, perhaps with the cold, looked somewhat like raw meat chops appearing from the delicate yellow gauze sleeves of her bridesmaid's frock. Kitty's big face was powdered so thickly over the cold skin with white rice powder, and then rouged so strongly on top of it all, that she almost looked to be wearing a pale lilac blotting-paper mask, with red-ink stains dashed in upon either cheek. "Oh, Tom, oh dear, oh dear, I know you are thinking that I look utterly and unspeakably stupid and altogether abominable and dreadful in my frock and wreath." She cried out, making for the looking-glass. "Not at all. Very charming indeed," said Tom, bowing stiffly. "Yes, you do! You do! I know it well Why bow in that extraordinary fashion? LILY!" she screamed aloud suddenly, "send that broach down immediately! Everybody is dressed and ready fro lunch!" A far-distant voice floated down the stairway: "I can't find it, Miss...."
"Yes, you can!" thundered Kitty. "Go fetch Rose, I tell you; don't be such an owl." "Really, Kitty, I don't think I can bear it!" said a voice from the drawing-room doorway. "Don't you think you could go upstairs and talk to them from up there perhaps." A small, neat young lady appeared smiling in the drawing-room doorway, her fingers in her ears. 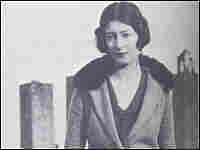 It was little Evelyn Graham, a schoolmate and bosom friend of the bride's. Over her yellow bridesmaid's frock was a grey squirrel fur jacket, and her face was muffled up to the ears in a fluffy woollen scarf. Her narrow green eyes danced and gleamed, and all colours of the rainbow seemed to be reflected in them. "Br-r-r-r-r-r, I am more dead than alive!" said she, coming over to the fire, and with horror in her voice. She chafed her thin hands together rapidly, then knelt down and held them out to the blaze. "You are like a dear, elegant little fly," said Kitty, watching her with a passionate look, and at the same time winding up the gramophone handle. "I wish I were as chic and intellectual as you! You must think me a kind of great clumsy block-headed rhinoceros in my bridesmaid's frock, I know! Oh, don't speak about it, please! I do beg you!" "Tut, child, nonsense," said Evelyn. "Oh, what will it be like standing in that draughty church!-Without a coat on! Holding a sopping-wet bouquet of flowers! Really, these quaint old customs are no joke after all is said and done." "Quaint old...oh...really...Evelyn!" said Kitty, shocked. "Ah, but one of these days you will be married yourself, and you will see! You will be talking quite differently...you will make a most wonderful mother, I know. And so will Dolly, too,-in spite of all the things you two say nowadays...."
"Tut, child. Tut," said Evelyn. "Good gracious, what is that? A metallic whistling pealed suddenly out of the mouth of the gramophone. It continued, and presently took shape and became a trifling tune. Tigers seemed to be growling sulkily within the machine also, and it seemed that something like a hyena was faintly laughing too.